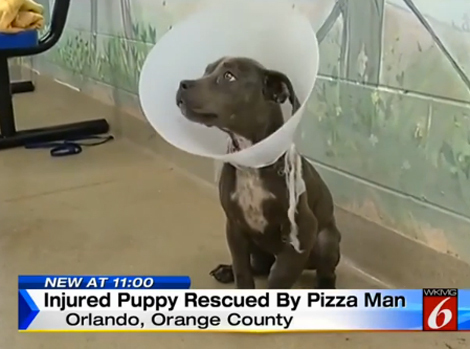 The hero found the adorable, neglected puppy while on his pizza delivery route in Orlando, FL. The adorable, three-month-old puppy you see below was rescued by a pizza delivery man hero in Orlando, FL. The delivery driver found her wandering down the street badly injured, near the home where he was delivering pizza. The quick-thinking hero then called Animal Services, who renamed the puppy “Pupperoni” as an homage to her rescuer. Local news station WKMG reports that Pupperoni had several bite marks on her leg (potentially from another dog), and the limb may need to be amputated. But Pupperoni is being cared for and on the road to recovery. When she finally does recover, Pupperoni will either be put up for adoption or given to a rescue group. As we’ve said before, the pizza deliverer is a testament to human kind’s endurance and goodwill.